The largest tendon in the body, the Achilles tendon is a cord connecting the calf muscles to the heel bone. Also called the ?cord of Achilles,? the tendon gets its name from the hero of Greek myth. According to legend, Achilles was invulnerable everywhere but his heel, where a poisoned arrow eventually felled him. Because the blood supply to the Achilles tendon lessens with age, the tendon becomes vulnerable to inflammation and rupture, a fact which makes it a true ?Achilles heel? for many older patients. Achilles tendon injuries are also common among athletes and those who engage in more physically demanding activity. Patients with an Achilles tendon rupture will often complain of a sudden snap in the back of the leg. The pain is often intense. With a complete rupture, the individual will only be ambulate with a limp. Most people will not be able to climb stairs, run, or stand on their toes. Swelling around the calf may occur. Patients may often have had a sudden increase in exercise or intensity of activity. Some patients may have had recent corticosteroid injections or use of fluoroquinolone antibiotics. 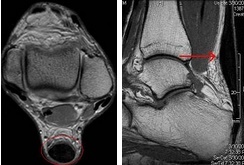 Some athletes may have had a prior injury to the tendon.